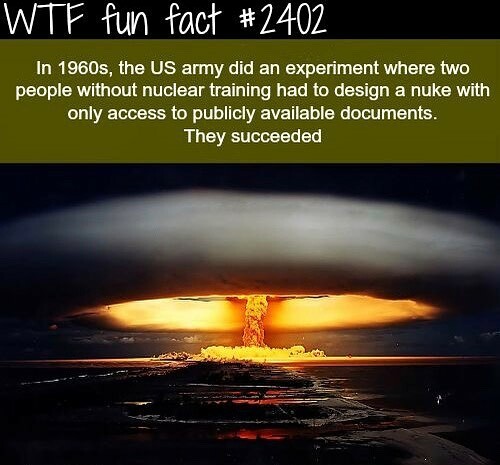 Nuke development doesn't worry me. In the age of the internet and big brother watching, you would be caught in a New York second just by typing a few key words in sequence...and that applies no matter where you live. The mass destruction thing that worries is the bio stuff. That junk is written in books all over the place and if you have access to those old skool book stores...I'm talking about the mom and pop joints that people just give those old high school textbooks, medical journals, etc... to after a loved one has passed then that's where you can do the deed without coming to the attention of officials. A little brains, determination and evil intent and we could be looking at a mass casualty event. The price you pay for living in interesting times I guess.